I really don’t know where to begin with this series. I haven’t seen much of Clark Kent as we have seen Superman in the New 52 (Till October 2011). I was expecting more of him rather than Superman himself in the first issue of Superman. I don’t really know what the team behind Superman is up to. Issue 1 begins slowly and steadily and remains that way throughout. It feels like I was reading a picture book more than a comic book. To be fair, I love the argument between Lois and Clarke about the Daily Planet and its future. It is intense and very well written. 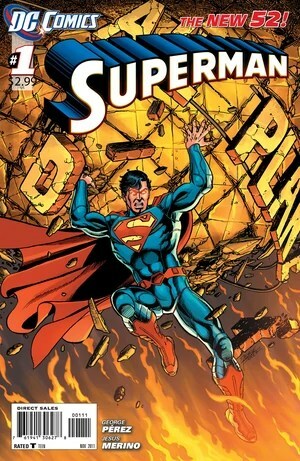 As soon as that argument is over, Superman is seen doing what he does best – fight the bad guys. Two things: Its very abrupt and its heavy on narration and not on dialogue. One of the terrorists looks like Yoda for some reason. And twitter gets a mention too. I don’t really like anyone explaining me that ‘Superman is resorting to his own brand of surprise tactics’ when he is lifting a truck in the air. That’s a given. Really. It doesn’t matter if it’s a relaunch. Everybody knows who Superman is and what he can do. Major Let down. The artwork is good, but it gets marred by the narratives and long dialogues. The panels also feel cramped because of them. It feels like it hasn’t been allowed to set free. It has so much potential. Hopefully it will pick up in the next few issues. As for the story, Superman doesn’t speak much. But the supporting characters do. All in all, honestly, I would give it a 5/10. I’ll wait for atleast 5 issues before I can conclude my opinion about this series.